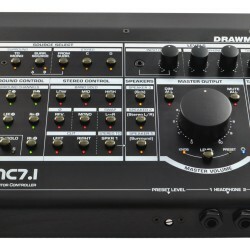 The Drawmer MC7.1 Surround Monitor Controller is a combined 7.1/5.1 and stereo monitor controller. 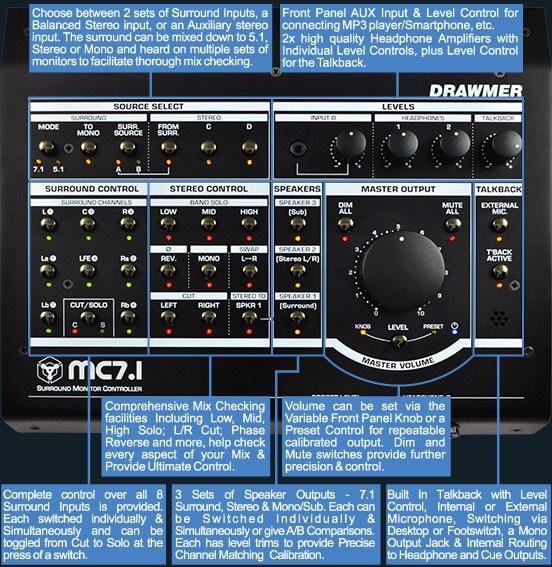 Designed to provide all the mix checking features required for surround recordings without compromising on those used in stereo monitoring. 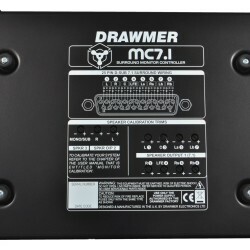 It has the same pristine & transparent design as others from the Drawmer monitor controller pedigree, with a rugged desk top “wedge” form factor as used in the popular MC3.1. 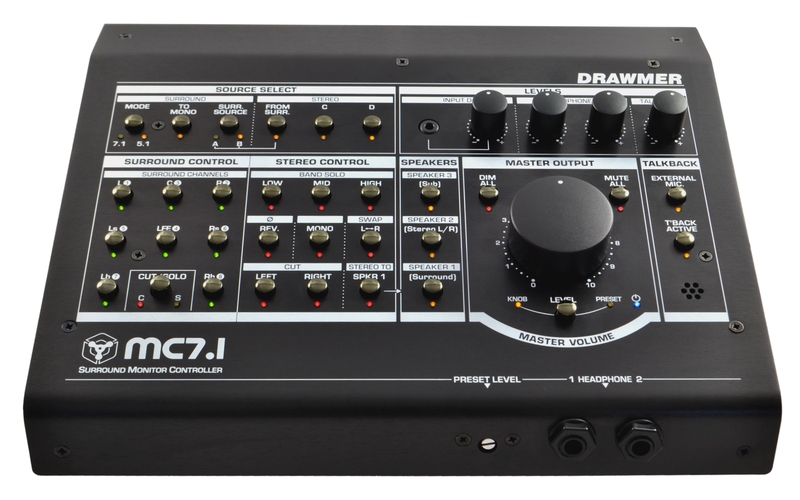 The MC7.1 is a powerful Surround Monitor Controller in its own right, but is also perfect for controlling and checking your stereo mixes. This is one area where other surround monitoring controllers fall short. 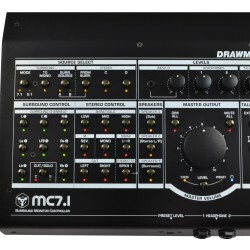 All studios, whether dedicated to film audio post production, or small home studio will at at some time (if not most of the time) work in stereo as well as surround. 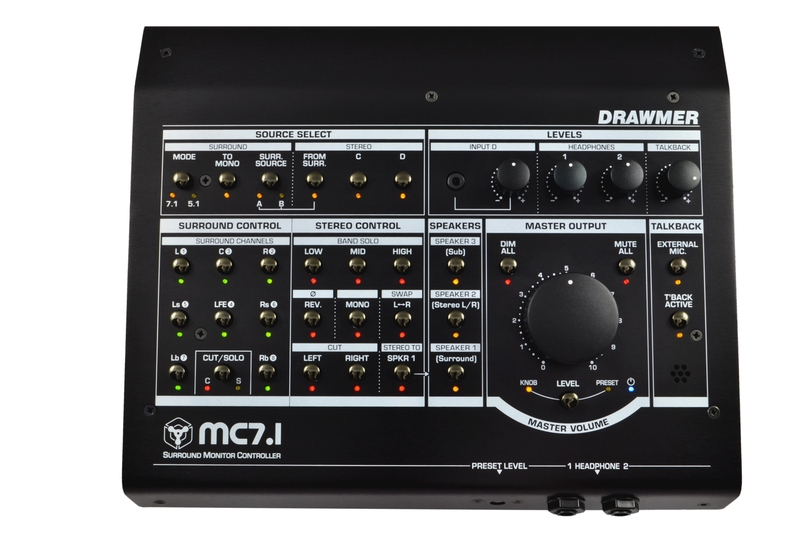 Aside from the surround capabilities, the MC7.1 contains the same comprehensive set of stereo “mix check” functions that are presented on the MC3.1 and which can of course be applied to the stereo input channel or any of the surround channels when these are routed to stereo. 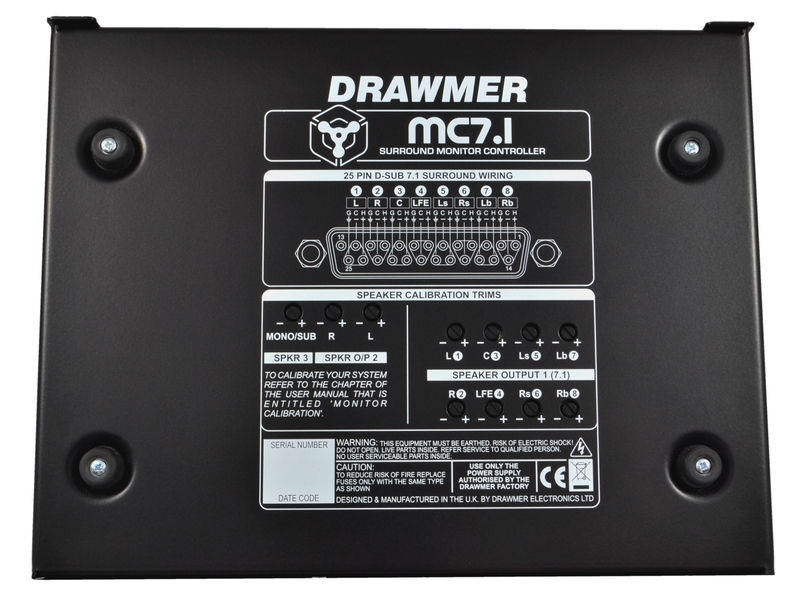 The ability to “mix down” the surround mix to the FL and FR speakers OR the independent Stereo main speakers combined with the comprehensive cut or solo matrix means any combination of the surround channels can be listened to in the front mains. Want to focus in on the rear channels? Simply mix down to the front stereo speakers then solo them out of the mix! 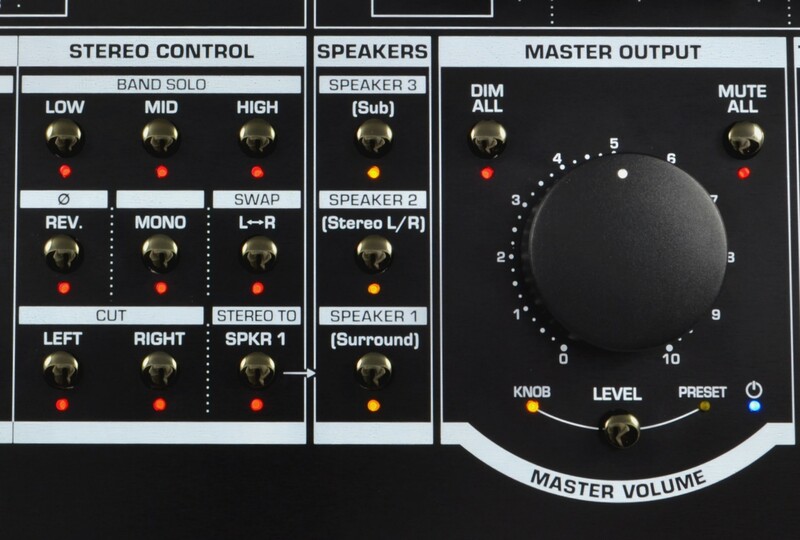 Whilst soloing out the centre or LFE channels give a central mono representation across the fronts or stereo mains! 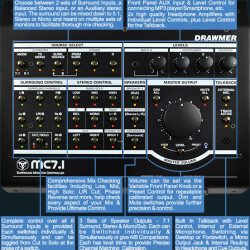 Speaker level matching with switchable Mono/Sub output, the popular Low/Mid/High band solo feature, Internal Talkback Mic with optional latching or non-latching footswitch control, and External Talkback Mic input are all brought over from the MC3.1, completing the rich array of features available on the MC7.1. 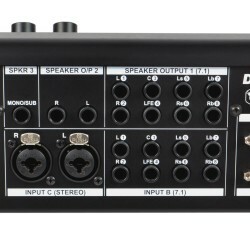 Built In Talkback with Level Control, Internal or External Microphone, Switching via Desktop (non-latching) or Footswitch with TS connector (latching or non-latching), & Internal Routing to Headphones and also a Mono Output Jack. 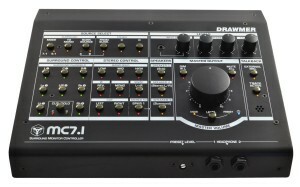 The MC7.1 is all analog so it won’t need to be rebooted due to software crashes, and doesn’t require firmware updates. Desktop ‘wedge’ form factor with a rugged steel chassis and a Kensington security slot for added protection.